David Buchanan is a Postdoctoral Fellow in the Department of English and Film Studies at the University of Alberta and an Instructor in the Centre for Humanities at Athabasca University. 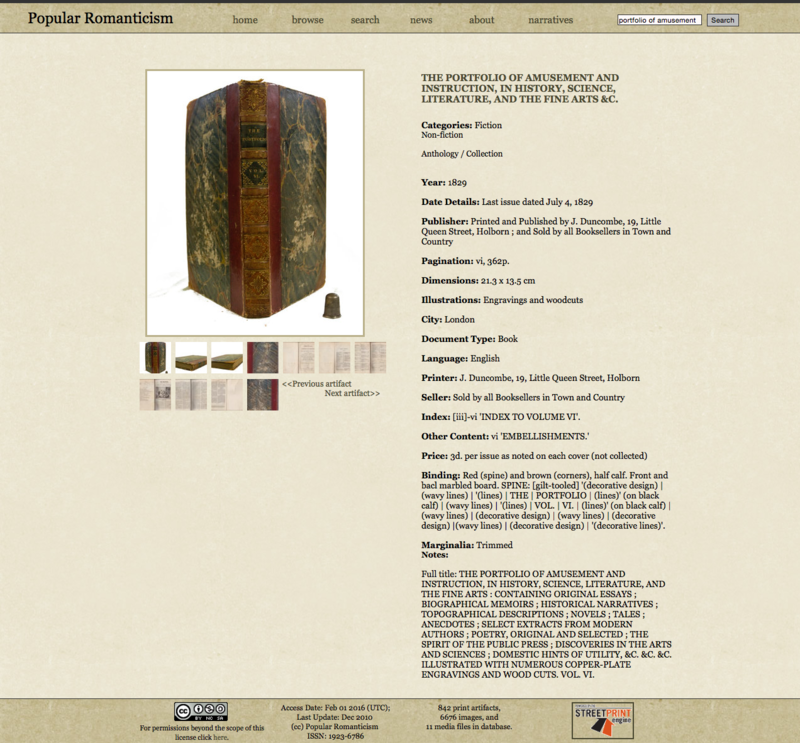 Popular Romanticism (http://poprom.streetprint.org/) is an open access online resource for the study of print and reading in the Romantic period. The following questions are of central importance: What did people read? How did people read? How did such things change over time? How can this be described? 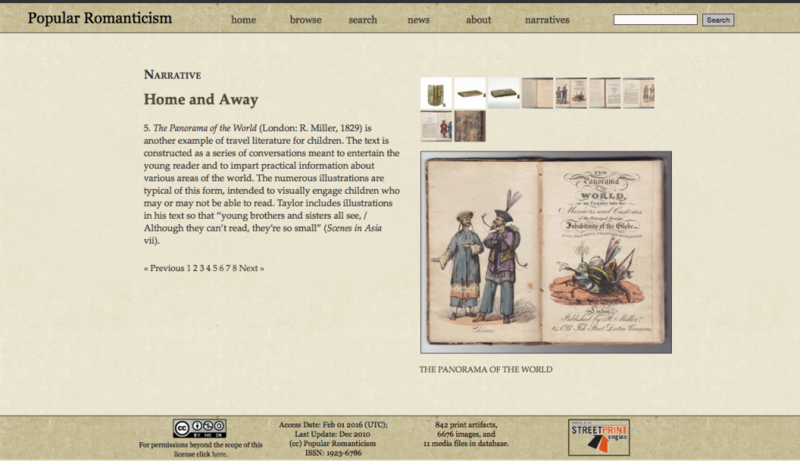 The archive includes bibliographic description and select images for over 800 print artefacts: about 250 artefacts from a previous project site called Revolutionary Romanticism (mostly ballad-sheets, garlands and chapbooks) and over 500 others added since 2009. It includes a wide range of document types: notices, announcements and receipts; the ballad- or story-sheet; the garland of songs; the chapbook; the pamphlet novelette; the magazine or newspaper containing fiction; the weekly or monthly ‘number’ or portion of a book; the volume-form literature anthology; the single- or several-volume fictional work; and the multi-volume collection of novelists, poets and/or dramatists. Users can search the archive by author, publisher, date, place of publication, document type and a variety of other categories. 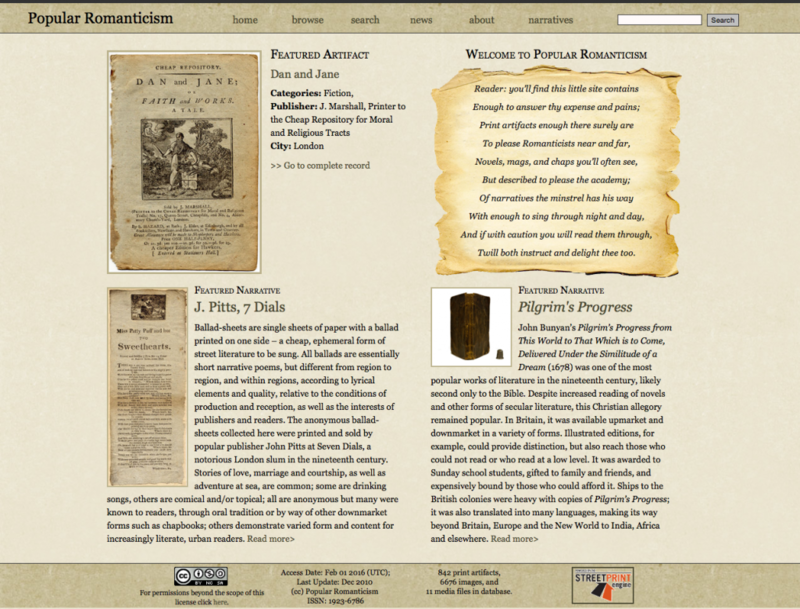 The site also includes fifteen multimedia ‘narratives’ to further describe the production, dissemination, and reception of popular print in the Romantic period. The following is a brief description of some of the research directions. Some could afford to read upmarket poetry, novels and encyclopaedias, others only downmarket chapbooks, garlands and ballad- or story-sheets. But other common forms of ephemeral print were increasingly important to the way people from all walks of life communicated with each other and managed their affairs. They could enable accountability, communication and organization, as well as security, hope or amusement. 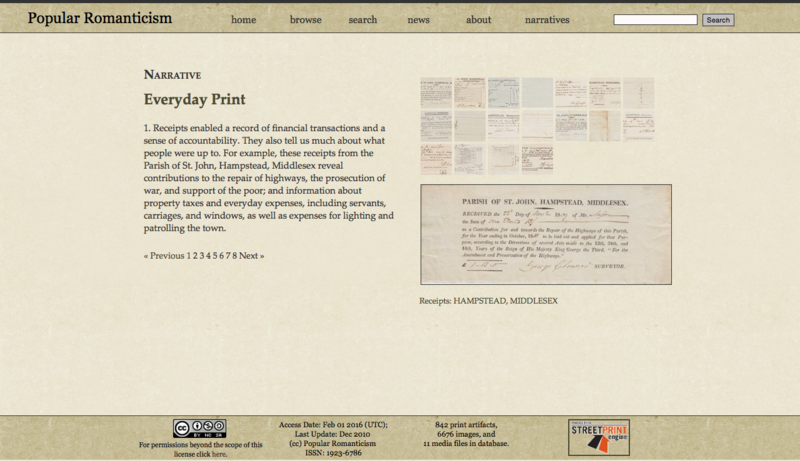 Receipts enabled a record of financial transactions and a sense of accountability. They also tell us much about what people were up to, what they valued, supported or prioritized. For example, receipts from the Parish of St John at Hampstead, Middlesex reveal contributions to the repair of highways, the prosecution of war and support of the poor; and information about property taxes and everyday expenses, including servants, carriages and windows, as well as expenses for lighting and patrolling the town. Receipts could also say something about systems of risk and reward, investment and accumulation, or perhaps scheme and plunder, as with lottery tickets. Insurance documents indicate a different sort of interest in and means of achieving investment and security. Some describe insurance for houses and other buildings, goods, wares and merchandise, and ships in harbour, in dock or while building from loss or damage by fire, including costs (assurances on lives were also available). Announcements in the form of a single sheet with print on one side were easily distributed or posted. They could be used to outline rules and regulations, thus contributing to the maintenance of peace and order. Announcements and advertisements also enabled public communication of events or opportunities; it was an important form of disseminating information, particularly effective in more densely populated urban communities. Passers by read such signs individually or to a group, which might include those unable to read. In these and other ways, notices for meetings also helped people to connect, organize and work or socialize together. In these and other ways, ephemeral print enables a better understanding of print culture broadly defined, as well as the practices of everyday life in the Romantic period. This was no less true of ephemeral forms of fiction such as ballad-sheets as it was of upmarket works of philosophy, history and literature. Popular Romanticism contains more than fifty such artefacts printed and distributed in the infamous Seven Dials slums of London from about 1802 to 1820. All ballads are essentially short narrative poems, but different from region to region, and within regions, according to lyrical elements and quality, relative to the conditions of production and reception, as well as the interests of publishers and readers. The content of ballad-sheets, as such, was wide ranging. Traditional folk tales were common, many of which concern love, marriage and courtship, or adventure and risk; but many other ballad-sheets used new material adapted to contemporary circumstances, local populations and urban settings. The latest hits of the stage could be used to attract interest among those unable to afford a seat at the theatre. The name recognition of popular contemporary writers helped to sell new material. Street ballads could be topical, providing a form of news to compete with the more expensive newspapers. They could also be political or religious, often in a satirical manner that enabled a combination of amusement and instruction. 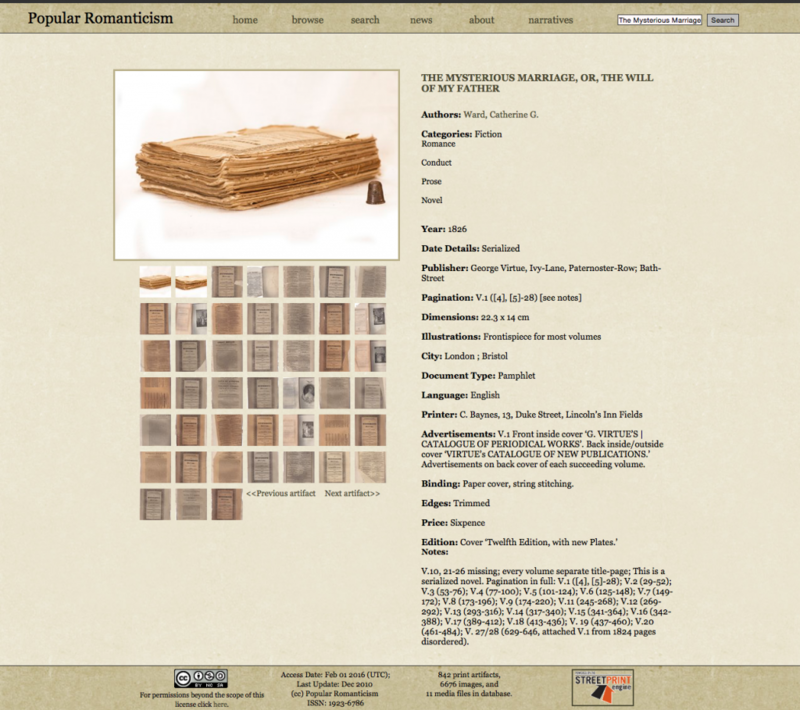 The variety of ballad-sheets available, their popularity and the social value of being able to read them would have provided a strong incentive to achieve literacy. It is very likely that ballad-sheets played a significant role in the expansion of literacy and reading in the early nineteenth century, long before the 1870 Education Acts in Britain. Read individually and sung to or with others, ballad-sheets were an important form of expression, communication, education and socialization. Self-expression and group recognition were likewise furthered by the use of ballad-sheets to decorate living and social spaces, pasted on walls or ceilings in homes or pubs. Ballads were collected for upmarket print collections such as Thomas Percy’s Reliques of Ancient English Poetry (1765) and Joseph Ritson’s Robin Hood: A Collection of All the Ancient Poems, Songs, and Ballads, Now Extant, Relative to that Celebrated English Outlaw (1795). Many of the best-known poets of the Romantic period imitated and adapted the traditional ballad form, including William Wordsworth and Samuel Taylor Coleridge in the collection Lyrical Ballads, with a Few Other Poems (1798) and Walter Scott in the long narrative poem Lay of the Last Minstrel (1805). Students of Romanticism will recognize these names and works, and they will likely be familiar with chapbooks, but they may be less familiar with the ‘garland’, a small book of ballads usually eight pages in length and printed cheaply on thin paper with a woodcut on the cover and a binding composed of string (if it was bound). Outside of London, Newcastle-upon-Tyne was a centre of popular print in England throughout the Romantic period, offering chapbooks, broadsides and songbooks of various sorts to meet the needs and interests of downmarket readers. 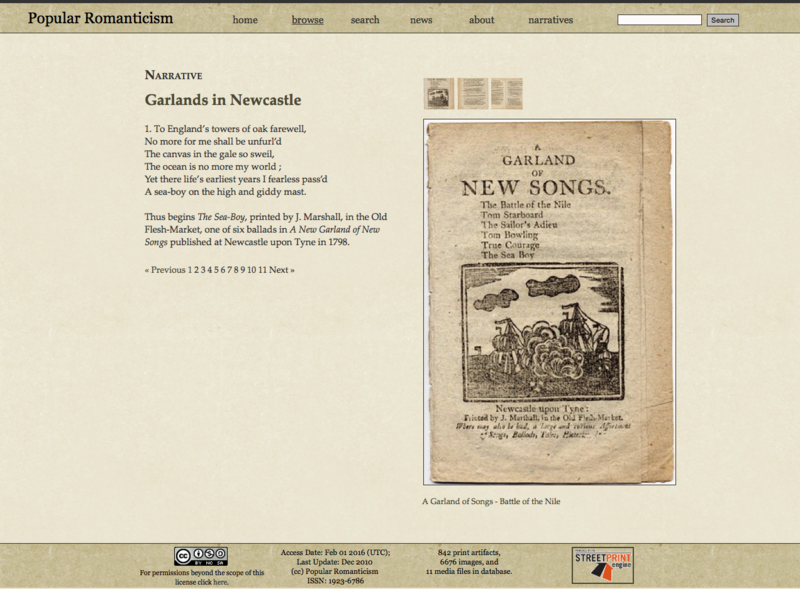 The ballads collected and printed as garlands in Newcastle upon Tyne were intended for local, working-class people. The paper of a garland is thin, the ink is light or uneven and the woodcuts often do not seem relevant to the story. There is no elaborate binding of full calf leather with gilt lettering upon the spine—suitable for the drawing room or library. Despite the prevalence of universal folk and romance tales, some of the ballads are also localized, with specific references to the Yorkshire region or to Yorkshire people. Proximity to the Scottish border clearly also impacted content, wither references to Highland Mary or the Tweed, not to mention the use of Scottish dialect. Contemporary events were also recognized. Garlands aimed to entertain, but in a way that mattered to local readers. However comical or entertaining, garlands could also be political in several instances and ways. First, in that they portrayed working-class people. Second, in that they addressed the realities of working-class life. Third, in that they took on national subjects from a working-class perspective. And fourth, in that they were produced for and made accessible to working-class people. Ballads printed as garlands participated in the complex transition from feudal and agricultural community to the industrial and capitalist modern state. Garlands met the needs of downmarket readers in Newcastle and elsewhere by combining traditional storytelling and cheap print to address contemporary issues in a way that was known and appealing. Chapbooks were the popular pamphlets of the poor. Similar to ballad-sheets and garlands, they began as a sort of printed folklore. 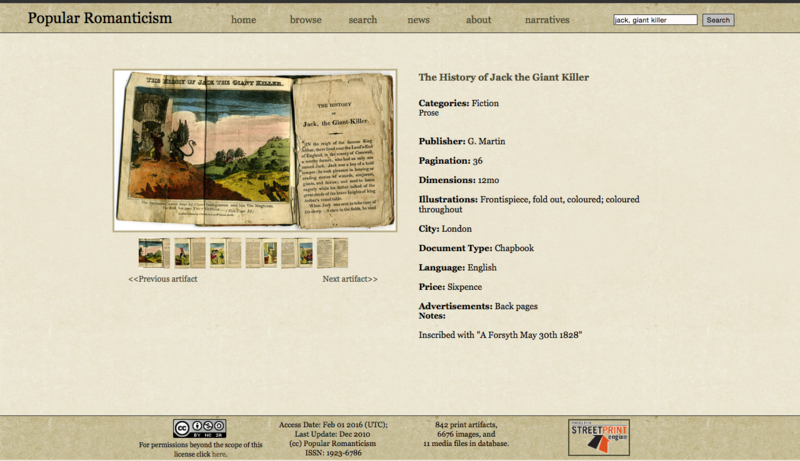 Early popular stories disseminated by travelling salesmen or colporteurs included secular adventure narratives such as Jack, the Giant Killer and Robin Hood. They had the quaint woodcut illustrations, but displayed a broader scope than the ballads; they retold old romances and fairy tales, ancient battles, superstitions and riddles, interpreted dreams, foretold the future, etc. Later chapbooks varied considerably in content, theme and language; they were often adapted from popular novels for specific audiences and political purposes. Most chapbooks were 8–32 pages in length and sold for as little as a halfpenny and usually for less than sixpence, thus making them widely available to the working classes. They were available in the city and the countryside, often available at fair or market days. The established downmarket price point, or threshold of profitability and affordability accepted by publishers and purchasers, was sixpence. 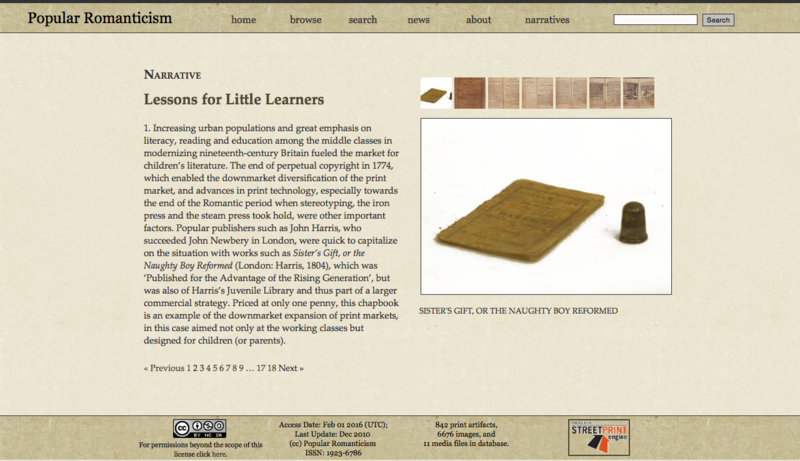 The price of chapbooks ranged from a halfpenny, like ballad- or story-sheets and garlands, to a shilling. Chapbooks were used for different purposes. The Cheap Repository for Moral and Religious Tracts, for example, a Christian, middle-class organization, attempted to target downmarket readers with religious conduct literature by capitalizing on the longstanding popularity of the chapbook. New versions of chapbook classics, as well as adaptations of old and new novels, for example Daniel Defoe’s Robinson Crusoe (1719) and Scott’s Waverley, or ‘tis Sixty Years Since (1814), were popular. Even at the lowest prices, significant variation in chapbook form is apparent. Writers and publishers adapted to and furthered increasing demand for literature by diversifying formal and thematic resources, and by manipulating the format and price of downmarket options. A typical chapbook is a short, secular, plot-driven tale accompanied by woodcuts featuring key moments and figures in action. Later, publishers altered the form and content to attract or increase readership. Covers could be blue or yellow, and the type and woodcuts (or engravings) of higher quality. Coloured covers became more common after about 1810, when publishers attempted to distinguish new chapbooks (i.e. new versions or adaptations of new works) from old-style chapbooks. For example, a penny chapbook adaptation of a Scott novel might be similar to a traditional version of Jack, the Giant Killer, but another sold for 6d or 1s would likely be longer (i.e. 32–52 pages), printed on better paper and might include decorative borders, coloured covers and high-quality illustrations. Such differentiation in format, content, and price enabled increased fragmentation of the print market, which helped to identify and create new readerships. Robinson Crusoe, for instance, was published as The Wonderful Life and Surprising Adventures of that Renowned Hero, Robinson Crusoe (1813), a chapbook from Ross’s Juvenile Library. Robinson Crusoe (1830) is only eight pages and similar in appearance to the Ross edition, except for the yellow covers. The Adventures of Robinson Crusoe (1818), on the other hand, is a 170-page book covered in marbled boards with morocco (usually goat) leather down the spine and probably sold for several shillings. New novels were expensive, but they were also made available to readers in many forms. Circulating libraries rented novels by the volume, which made expensive new novels more accessible to middle-class readers. Similarly, the price of novels decreased as part of collections of a single author, for example the novels of Scott in 48 volumes from 1829–33 (each volume 5s), or selected works of various authors, such as Bentley’s Standard Novels (each novel 6s). Novels were also sold in parts and numbers, serialized in magazines and newspapers, and adapted as chapbooks. The pamphlet novelette was another innovation that increased circulation. It was usually an abridged or adapted version of a novel sold at a price (6d) available to the working class. Out-of-copyright novels such as Jacques-Henri Bernardin de Saint-Pierre’s Paul & Virginia (1788), and new middle-class novels that sold for 10–30s or were otherwise available at circulating libraries, became available in this format. Weekly or monthly ‘numbers’ or ‘parts’ of a book helped make some modern fiction available to downmarket readers complete and unabridged. The Mysterious Marriage, or, the Will of My Father by Catherine G. Ward, for example, was serialized from 1824–26 as part of a series of ‘Original Novels and Romances embellished with engravings’. Magazines and newspapers also frequently included fiction in verse and prose, depending on the format, content, objectives and readership of the periodical. Bindings for chapbooks and pamphlets were used to hold together the pages of a single work that was not constructed to last and meant for the working classes. Part or full leather bindings could serve as a means of preserving a text for posterity, protecting against frequent use (sometimes including chapbooks or collections of ephemeral literature), or providing distinction. Cover design was used to differentiate downmarket and upmarket works. Publishers employed colour, decorative design, and higher quality illustrations to cater to or create new markets for pamphlet fiction. Book covers could be practical or lavish, depending on taste and budget, the perceived value of the work, the social standing of the purchaser and the intended use of the book, involving gilt and/or blind engraving; various colour schemes; different forms of marbling for the boards; quarter, half or full leather; which could be made of calf, goat or other types skin; and cloth binding (later). Covers indicated different material, cultural and social valuation of copies of the same work; they also reflected and contributed to the diverse print market of the Romantic period. Increasing urban populations and greater emphasis on literacy, reading and education among the middle classes fuelled the production of literature specifically aimed at children (or their parents). Literature produced for or read by children in the Romantic period included fiction and non-fiction, poetry and prose, chapbooks, picture-books, novels, magazines and more; it was available upmarket and downmarket; it could be entertaining, it usually intended to instruct and it sometimes did both. During a period of changing attitudes to parenting and childhood, expansion of the print industry and increased attention to literacy, reading and education, literature for children enabled a means of shaping the tastes, habits and interests of young readers, and possibly of improving their chances of getting on in life. Religious organizations and popular publishers recognized and furthered the growing consumer market for children’s literature by creating works differing in presentation, content, format and price throughout the period. The weighty works of travel writers were largely available to upmarket readers due to their high cost, although the cheaper pocket-sized editions that began appearing in the late eighteenth century and the lengthy excerpts from new travelogues featured in periodicals made the genre more widely available. Travel literature was a complex genre intended both to instruct and to entertain. The content of travelogues appealed to a broad range of interests and was easily and frequently adapted to meet the changing tastes of the public. Ethnographic description, antiquarian examination, scientific observation and cataloguing of sites were interspersed with aesthetic contemplation, personal reflection, political polemic, humorous or sentimental anecdotes, poetry and gothic tales. The Romantic period witnessed a gradual separation between literary and technical travel writing; guidebooks emerged in the early nineteenth century to address the practical concerns of an increasingly mobile middle class, while the literary travelogue became less concerned with the mechanics of travel and increasingly emphasized introspection and the operation of the imagination. Anthologies, collections, cabinets, encyclopaedias and portfolios reflected the varied interests of downmarket readers. The Portfolio of Amusement and Instruction in History, Science, Literature, and the Fine Arts (1829), for example, included ‘original essays, biographical memoirs, historical narratives, topographical descriptions, novels, tales, anecdotes, select extracts of modern authors, poetry, original selected, the spirit of the public press, discoveries in the arts and sciences, domestic hints of utility, &c.’ Such collections enabled the careful selection of ‘classics’ or useful works intended to amuse and instruct. Changing attitudes to parenting and childhood, expansion of the print industry and increased attention to literacy, reading and education led to anthologies aimed at a juvenile audience. Many adults were also interested in a general knowledge of upmarket or ‘standard’ literature, indicative of an interest in upward mobility and the importance of social status. For example, John Bunyan’s Pilgrim’s Progress from this World to that Which is to Come, Delivered under the Similitude of a Dream (1678) was one of the most popular works of literature in the nineteenth century, likely second only to the Bible. Despite increased reading of novels and other forms of secular literature, this Christian allegory remained popular. In Britain, it was available upmarket and downmarket in a variety of forms. Illustrated editions, for example, could provide distinction, but also reach those who could not read or who read at a low level. It was awarded to Sunday school students, gifted to family and friends, and expensively bound by those who could afford it. 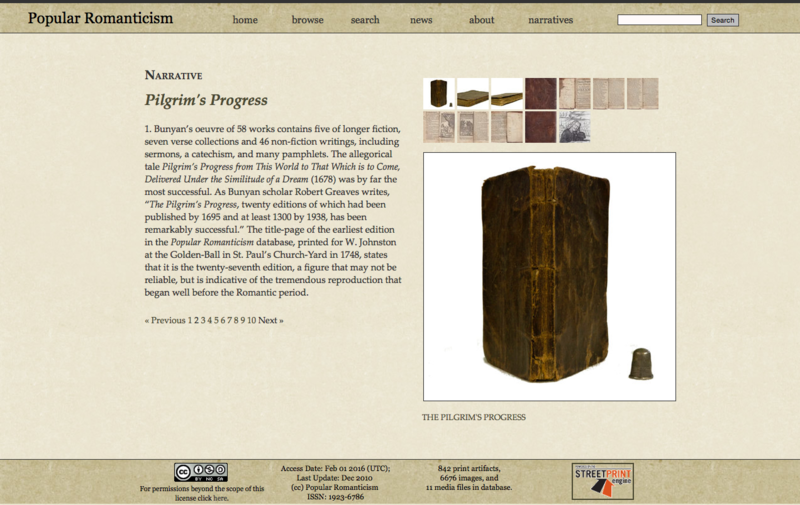 Ships to the British colonies were heavy with copies of Pilgrim’s Progress; it was also translated into many languages, making its way beyond Britain, Europe and the New World to India, Africa and elsewhere. The firms of Harvey & Darton and W. Darton were two of the most prolific publishers of popular literature in the Romantic period. William Darton Sr, Samuel Darton and William Darton Jr all specialized in children’s literature but also published jigsaw puzzles, poetry collections and other works of social, scientific and religious interest. 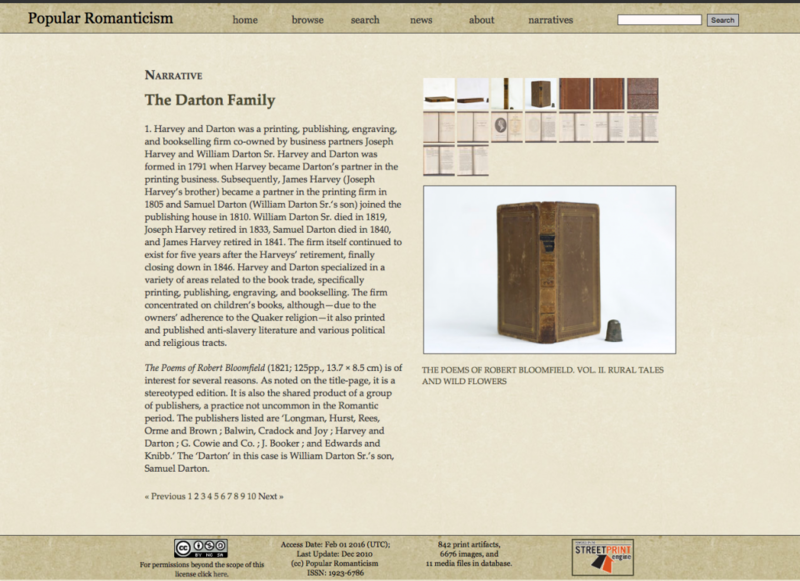 The Darton family was proficient in all aspects of the printing and publishing business. They were flexible and skilled enough to produce books, chapbooks and collections using stereotyping, collective publishing, innovative pricing, and high-quality illustrations by popular authors who could write entertaining stories that offered useful knowledge. While the Dartons’ sustained focus on children’s literature throughout their careers is indicative of the genre’s burgeoning popularity in the nineteenth century, it is also a reflection of their Quaker values. The dedication of the Society of Friends to moral reform and social regeneration manifested itself in a variety of causes, including an active interest in the rearing and education of children. The influence of the Dartons’ religious context is evident both in their choice of publications and in the particularly reformist tenor of the literature published by their firms. Broadly targeting a predominantly middle-class readership, their publications contributed to shaping the values of Britain’s dynamic middle-class culture. Underlying the shift from collection and description to the addition of multimedia narratives was a desire to use Popular Romanticism to tell stories, and in turn, to offer more accessible ways to enter into the history of print and reading. 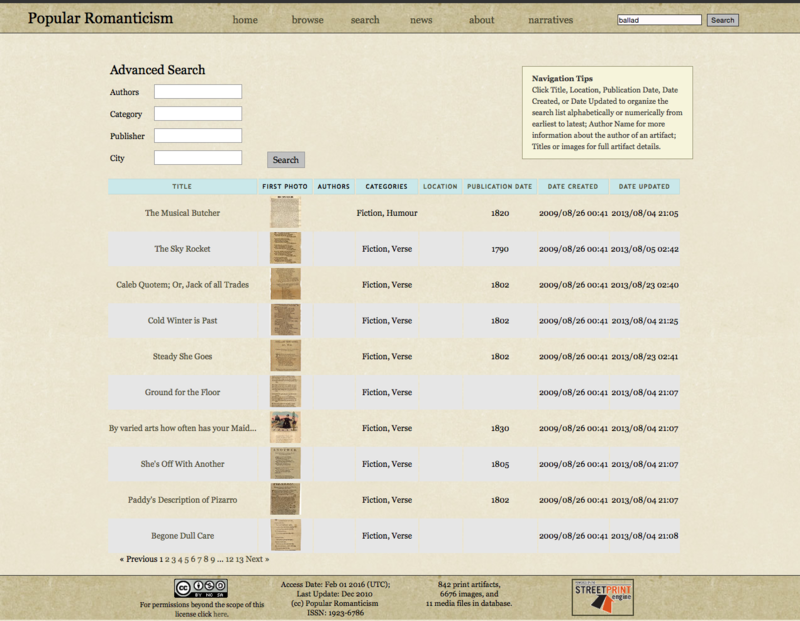 While developing a valuable tool for scholarly research, the primary aim was to make the site more useful in educational settings, and particularly in courses on literature of the Romantic period. 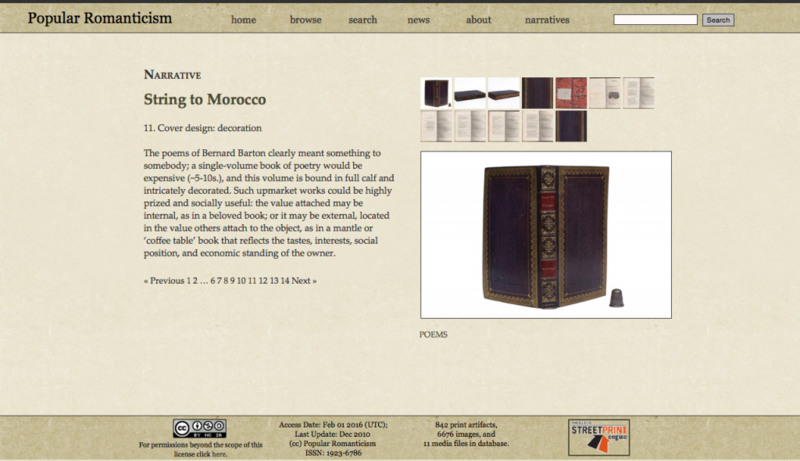 Since 2012, I have used the site in several related ways: by assigning the reading of particular artefacts, categories and narratives in courses on nineteenth-century literature; and by overseeing the work of graduate students on the writing of new narratives. To supplement the addition of materials and narratives, work in progress includes an index of useful terms, a print chronology, a list of further reading and learning modules intended for classroom use. A forthcoming site redesign will add social networking to further communication and collaboration.